The Mauldin Garden Club spends each year excitedly preparing for their annual fundraising event known as the Spring Fling. Over 30 members of the Garden Club gather items for a rummage sale, contact local businesses for products and services to be sold in a silent auction, prepare food for a bake sale, and generously fill the sidewalks with plants for sale. 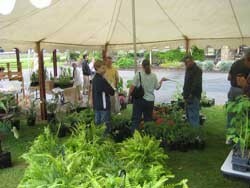 A large number of vendors fill the Cultural Center’s auditorium with a huge variety of products for home and garden. Proceeds from the Spring Fling have permitted the Mauldin Garden Club to landscape and help maintain the front of the Mauldin Cultural Center, install and maintain a Serenity Garden, landscape and help maintain the one-quarter acre that houses a log cabin that is over 200 years old, and continue to promote Mauldin as “The Daffodil City” by donating, selling, and planting daffodil bulbs. Daffodils have been planted at several public venues including the Mauldin Senior Center and Mauldin Public Library.